Japanese cream puffs - the crispy choux shell contrasting with the dreamy vanilla bean custard cream filling - are (still) my favorite desert. I hope I don't sound biased, but I think my recipe for Crispy Shell Cream Puffs is the best. Add strawberries and I think life is complete. Can you believe, my sister had never made Japanese style cream puffs before? This was her first time, she made them for my birthday and they were amazing. Which just goes to show, YOU can make these. And they will be amazing. Perhaps they didn't puff quite as high as some batches I've made before, but they did puff, and they were crispy and delicious. I was very impressed. Just add sliced strawberries while filling them and they turn into something magical. The cream puffs from my recipe are just a little more substantial than the light-as-air cream puffs from Beard Papa's. I prefer these. It was a delicious birthday. My mother made Sukiyaki for our extended family. These pictures are of the cream puff leftovers the next morning. (Sorry we already ate all the big ones! lol) After taking these shots I consumed all three. It was so good. - It is super quick and easy to make. One pot. Done. That is, if you use my recipe. You may have seen other recipes out there that tell you to sauté the pork. In Japan these days, ain't nobody got time for that. And there's no need. Taste this one pot wonder and you will be making it again. - You can't go wrong. The combination of umami-rich ingredients here mean this soup is going to taste awesome, no matter who makes it, no matter if you can't cook. - It's a healthy meal. Vegetables, protein, it's all here. Serve with a bowl of rice on the side if you like. 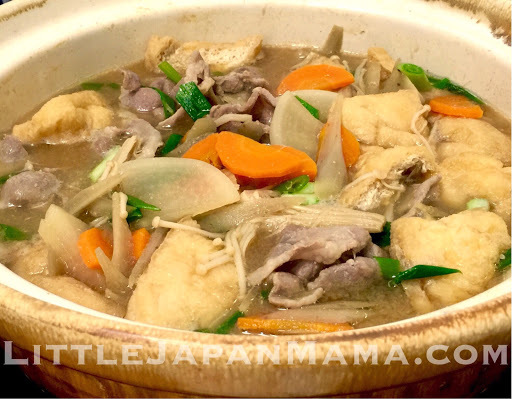 Tonjiru 豚汁 is a hearty Japanese soup and a winter staple. It's a low calorie comfort food that makes you feel good because it's good for you. And it tastes like home. "Ton" (or "buta" 豚 ) means "pork" and "jiru" means "soup" as in "Miso shiru" (Miso Soup). 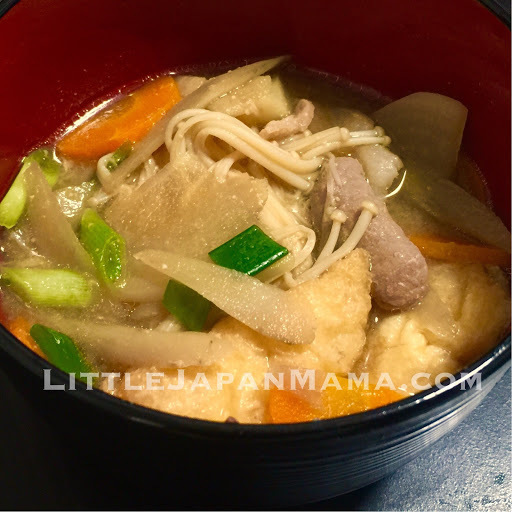 But I t's more like a meal than regular miso soup as it has pork and is full of vegetables. It's also a great side. 1) Boil about 3-4 cups water in a large saucepan. Add soy sauce and vegetables except for Shallots. 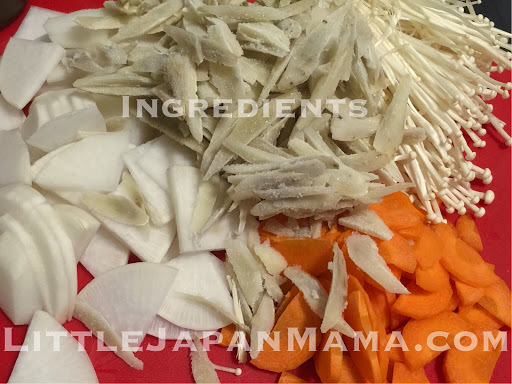 (Also add konnyaku, tofu puffs, enoki, if you have them) Simmer until vegetables are tender. 2) Stir in pork, keeping pork slices separate so they cook quickly. 3) Add the miso, then shallots. Serve. This won't take you long to make, so when you finish eating, please share your review in the comments below!